Behold the shepherd’s pie. Or is it cottage pie? It was made with lamb and beef mince. It’s the shepherd’s cottage pie. Anyway, it was good and that’s all that matters. This was a weekend-long endeavour. I made the mince on Friday, the mash on Saturday and cooked the whole lot on Sunday. The picture above is the Saturday stage. You, of course, could make it all in one go. It’s just that with my whirlwind social life (read: going down the pub) I had to curtail my cookery activities. Some meat, minced. Sorry, I can’t remember how much I used. Use the power of your brain to work out how much you think you’ll need. If you’re not sure, it’s always better to make too much. Always. You can use lamb or beef or a mix of them. You could, at a push, use turkey mince for healthiness although there is a risk it could be dry and weird. A couple of carrots, diced smallish. Potatoes. Sorry again, I didn’t measure how much. The correct amount is: whatever will adequately cover the filling. There is some controversy as to the correct ratio of filling to topping. I like them to be equal, Mr B prefers an excess of mashed potato. Optional extras: mushrooms, peas, whatever you fancy. Go crazy. Okay, to make the mince, fry/sweat the onions and carrots in a knob of butter (heh, “knob”) until they look glossy and soften. Add the garlic and fry for one minute more. Now add the mince and turn the heat up. If the heat is too low, the juice from the meat will seep out and instead of frying the mince will braise in its own juices. Which is not necessary a bad thing, but does prevent the mince from browning properly and can make it a bit chewy. Once the meat is nice and brown, crumble the stock cube over it, squeeze over the tomato puree and give it a good few splashes of Worcester sauce. Stir it all up and cook for another couple of minutes. Now add the beef stock. If you’ve got fresh, then bully for you and you should use that. I used another stock cube. Add enough to just cover the meat. Add a few sprigs of thyme. Now go and have a nice sit down and a cup of tea. Check back after twenty minutes. It should be simmering away nicely. What you want to happen is that the ingredients soak up some of the stock and it reduces down until there is a sensible amount of liquid for a pie. Use your judgement. When you’re happy that your mixture is fit for pie, pour it into the pie dish. This is the point where, if you want to go down the pub, you should pop it in the fridge. Everyone knows that mince always tastes better the next day. If you want to forge ahead, now boil the potatoes. Make the mashed potato as you like it, although here is an important point – don’t make it too wet because it will be soaking up some of the gravy from the filling. I used the traditional milk and butter. If you wanted to add a twist, some mashed garlic mixed in would be nice. Or even some spring onions. Now, using a spoon, spread the mashed potato over the mince mixture. Be careful not to get them mixed up as I often do so you end up with bits of mince mixed in with the potato. It’s not the end of the world if this happens though. 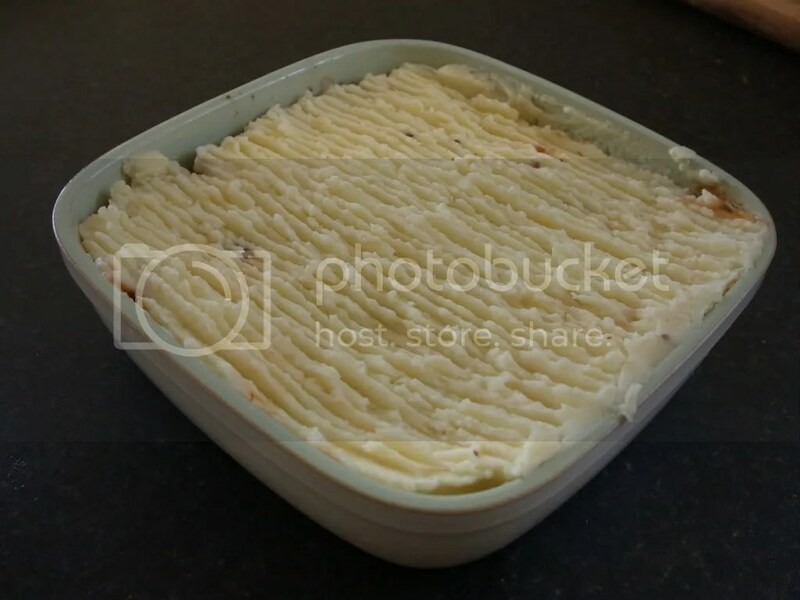 Now make ridges in the mash with the fork (as shown in the above photo). This is so that when it bakes the ridges will get crispy and brown. Here again you have another opportunity to stick it in the fridge and go down the pub should you so wish. If you want to forge ahead again (aren’t you keen?) pre-heat the oven to 200C/390F and sprinkle grated cheese atop the pie. Bake the pie until the top is nice and golden (you can probably also see the mince bubbling up round the edges). This should take about half an hour to 40 minutes. Now eat it! You don’t need to serve much with it because it already contains the meat and potato food groups. I served it with peas. It got compliments and was all eaten in one sitting by three people including one brother-in-law with a large appetite. Mr B had third helpings, which I’ve never seen him do before. A success. Shepherd’s Pie is an under-appreciated dish here in the States. I don’t know anyone who makes it regularly or any place besides bars owned by British or Irish people where you can get it. It’s a shame, because it’s not that hard to make and is super-tasty. And so! I shall be following this recipe very soon. Thank you. Now, of course, is where some other American comes in and tells me how often they make Shepherd’s Pie so I can have the Red Face of Shame. I am sad that the pie of shepherds is not appreciated as much there. It’s because you’re all too busy eating loaves of meat. And I very much dislike the loaves of meat, so for me it is doubly sad. Stupid loaves of meat. I keep typing that “loves of meat”, which is true. I do. Just not in loaves. For me, I’ll take the pie of shepherd over the loaves of meat anyday…but if I have a choice, I’d prefer the cream of ice! Ah yes, the cream of ice. Many a person’s downfall. in my book,nothing beats a shepards pie. here in the states its pure white trash!!! Lovely jubbly!! I added parsnips to potatoes as I had a few in the fridge. Hehe, I’ll be “some other American” and say that you can find tasty Shepherd’s Pie in many restaurants in Boston! I am happy to say it is still a favourite here in Canada. Lots of Scotch, Irish and Brits here. I love your website. come on Patricia Scotch is a drink were Scots thanks. Love your blog. An American from English stock, I grew up on good English food (as well as lots of other things in my mother’s vast repertoire). Have always made Shepherd’s Pie, even for company. For most of my guests, it’s the first time they’ve had it. It’s the perfect comfort food. You can also fry some leaks and add that to the cheesy topping. This is Delia Smith’s idea, not mine, although she reckons you don’t have to fry the leaks first. I make shepherd’s pie regularly because I married an Irish man who loves this stuff… I am Italian, would rather have loaves of meat smothered in sauce but then I’d be the only one eating that dish in my house. My husband likes the Pie made with creamed corn in between the meat and the potatoes. I made some pie for the shepherds today and was looking for the way to finish it off in the oven. Lucky I did, I had forgotten about the scoring of the mashed potato’s to encourage the browning of the topping. Cheese will be added before the baking of the pie. If you have a grill in the top of your oven, just switch from oven to grill for the last 5 minutes of cooking and your pie of the shepherds will have a lovely brown top when you remove it from the oven. Have just found this site. Had mince and spuds and damn all else. As I type, the mince hotpot is in the oven so I have half an hour to idle away. Like the earlier posting I put a veg between the mince and spud (I’m Irish) , in my case frozen peas just brought to the boil. Or, what joy, serve it with canned baked beans. So I sit down on the sofa watching the telly and heave it down – franky it is THE ultimate comfort food. (For utter vulgar decadence serve it with HP sauce. I may have to go and lie down before I get over-excited). not at all convinced that frozen petit pois mix well with baked beans ! !, and golly your easily excited! go have an After Eight Mint!, but careful now!! love cottage pie (try it between some ‘nasty’ white bread as a butty, you will never look back. shepherd’s pie or hot pot (complete with pickled onions) both served with pickled red cabbage. gone all WI now.